Malawian chambo is actually a type of fish that is endemic to Lake Malawi also known as Lake Nyasa. 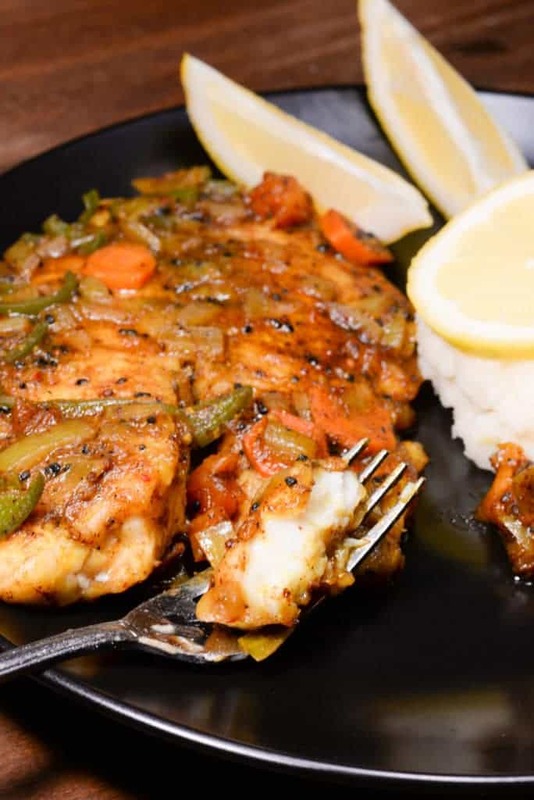 The freshwater fish is in the Tilapia family and therefore an easy fish to find to make this delicious dish. The recipe calls for two ingredients that need to made ahead of time. One is a curry spice blend and the other is a fruit chutney. The fish is fried and then cooked in sort of a gravy. The result is outstanding and we understand why this is one of the beloved dishes of Malawi. We served it alongside the national dish called Nsima which is a cornmeal porridge that is often the only meal a poor Malawian family may eat. This delicious sauce would be wonderful on chicken or eggs or toast or any number of things. Enjoy! Heat about 4 tablespoons of oil in a large frying pan and fry the fillets about 4 minutes per side and remove the fillets. Add the rest of the curry spice blend along with 1½ cups of water stirring so all the spice blend is nicely incorporated into the water. Add in the chopped carrots and green pepper and turn heat to a simmer. Place the fillets into the saucepan and make sure they are covered by the gravy. Close the lid and let the fish rest in the sauce for a few minutes. Serve with nsima (cornmeal porridge) or rice.